Annie’s Resource Attic » Blog Archive » Lands Down Under: Caves! The Land Down Under usually means Australia, but the real land down under is the dark, mysterious world of caves. I’ve had caves constantly on my mind lately for several reasons. First, a cave plays an important part in Treasure Hunt!, the story I’ve just posted. Besides a cave, it has a dancing starfish, deep jungle, a hungry gorilla, and pirate treasure. Maybe you should read Treasure Hunt! now, before we get lost underground. Next, I found two excellent cave web sites while researching information for the cave in Treasure Hunt!. I’ve put links to them both on this page and in the sidebar. The first site, The Virtual Cave, is filled with beautiful cave photos taken by its author, Dave Bunnell, who has set up interactive maps you can use to explore two virtual caves. It also has a wealth of information about different types of caves and cave formations. 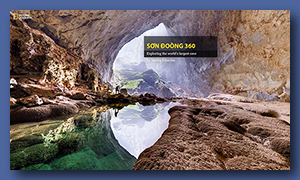 The second site is an online tour using 3D panoramas of the largest cave ever found, Son Doong in Vietnam. Because of its unspoiled condition, only a few scientific expeditions have been allowed inside, but you can see it in detail as if you were there. Most important for you, I’ve put together a kit that makes it quick and easy to create realistic pictures of your own imaginary caves. Start with any of five empty cave backgrounds and simply add clip art cave formations to make spectacular cave scenes. As you can tell, I’ve always been fascinated by caves. While looking at the many cave types described on The Virtual Cave site, I realized I’ve been in quite a few of them. For a quick side trip through my own cave adventures, click here. Then come back and find out more about the two cave web sites and the Cave Construction Kit. There’s no better place to start learning about caves than The Virtual Cave home page. It links to sections about four main cave types: Sea Caves, Erosional and Glacier Caves, Lava Tubes, and Solution Caves. Slide shows of amazing photos fill the first two sections. The Lava Tubes and Solution Caves sections both have interactive maps so that you can jump instantly to any cave room and examine a particular kind of formation. 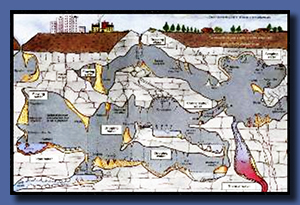 The Solution Cave interactive map was the first part of The Virtual Cave site, started in 1995. Dave included photos of just about every type of cave formation possible in this virtual tour. An extensive table of formations listed by name also links you to photos and information on specific formations. You’ll see even more unusual formations when using the idealized Lava Tube map. Lava tubes form when molten lava cools on the outside and the liquid lava inside keeps flowing. Did you know that there are lava stalactites? Additional links on the home page lead to photos of cave life and some of the world’s largest cave formations. Don’t miss the cave life section. There are lots of unusual critters in caves besides bats! 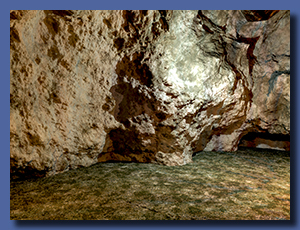 The Virtual Cave is an excellent reference site, and a must for students doing reports. Dave Bunnell even gives permission to use his photos in school projects and presentations. An adaptation of The Virtual Cave (Solution Cave map only) on a PBS Learning Media site may be easier to operate. I’ve included that link also. Be sure you have Flash® installed and active! Visit the PBS site to download printable support materials including a background essay and discussion questions. Plan to spend all afternoon enjoying this wonderful National Geographic site. It is a virtual hike through the world’s largest cave, a true lost world underground. Some of its passages are so large a 747 could fly through them, and the amazingly detailed panoramas in this tour capture that feeling of immensity. The interface is very well thought out, with an information panel and a map that you can hide or show. You have a choice of navigating by clicking points on the map or, to make the experience even more immersive, close the map and click arrows to move forward or back. You can turn to look all around, up, and down at each point. You can zoom in on details, too, even on objects several hundred meters away. On a large screen, it feels like you are part of the expedition, as you hear other members of the group around you. On a tablet, the view changes logically as you move the tablet around. This site functioned well on several devices, including an older iMac and and older iPad. Be sure to close the map whenever you aren’t consulting it, because it does cover the view slightly. I went through the entire tour rapidly the first time, enthralled with each incredible vista. Then I immediately started over and went through slowly, turning around, looking down and up, and zooming in on each formation. After looking at all these beautiful caves, you and your students will be as cave-crazy as I am. Then you’re ready to make your own imaginary caves using the Cave Construction Kit! The kit includes five full-page (1024 x 768 pixels) background cave scenes and a lavish collection of cave clip art with which to decorate the rooms. The clip art stalactites, stalagmites, columns, flowstone, and other cave formations are in .gif format so that they will load cleanly into most multimedia applications. You can preview the cave art in the Gallery, and you’ll find that link with the download link. I’ve also created a PDF catalog of all the cave art. This could be printed or viewed on computer to help students choose from the clip art collection. In the catalog, items from each folder are arranged in a group in alphabetical order. With such a wide selection of cave formations, you are limited only by your imagination in making spectacular cave scenes. Besides serving as a creative and fun art activity, the Cave Construction Kit might be the catalyst for having students write a great cave story! 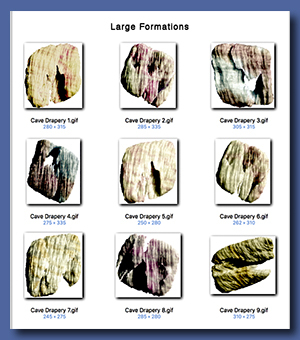 This resource doesn’t require a tutorial, but I’ve written and included a PDF describing what’s in each folder of clip art and giving suggestions for setting up various rock formations. It also has tips for specific applications such as IntelliTools Classroom Suite® and HyperStudio®, and ideas for how to use your cave scenes on and off computer. Subject area: Art, Science, Writing. The Virtual Cave link Click Here. Dave Bunnell’s original The Virtual Cave site, with interactive maps for solution and lava tube type caves, and extensive photos and information about sea caves and erosional and glacier caves. Flash is not required; this site should work on any browser. PBS Virtual Cave link Click Here. PBS Learning Media adaptation of The Virtual Cave. Only includes interactive map of the Solution Cave, but the interface and fewer links may be better for young students. Downloadable support materials. The Virtual Cave in this format requires Flash to be installed and active. Son Doong 360 link Click Here. National Geographic web site with a tour of the world’s largest cave, Son Doong, in the form of extremely high definition 360º panoramas. CaveConstructionKit.zip (32.3 MB) Five bare cave backgrounds in JPEG format and a vast collection of cave formation clip art in GIF format. 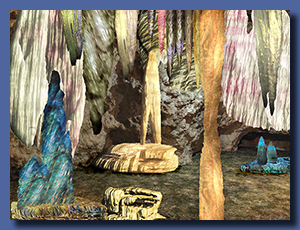 Add the clip art to the backgrounds in multimedia and graphics applications to make beautiful cave scenes. To preview the collection, click here. Cave Construction Kit Instructions online The Cave Construction Kit Instructions online, ready to present to groups.